21 | July | 2011 | K.I.S.S. This side dish is so, so easy and really good. It is a very easy way to add spice and flavor to a meal. All you have to do is throw all of the ingredients into the rice cooker and you are done. I served it with baked trout. It was a perfect combination of flavors. The rice added the kick I was looking for with the trout. In rice cooker, combine the box of Zatarains low-sodium mix, can of diced tomatoes with liquid, 1 cup water, chopped onion, and diced sausage. Cook until rice is done. Stir the chopped green onions into the rice mixture, cover, and let sit. Serve as a side dish with any meal where you want to add a bit of spice. I served the creole rice with baked trout. I seasoned the trout on a pan with salt, pepper, cavenders, thyme, fresh lemon juice and olive oil. Bake it at 350 for 20 minutes or until flakes when cut into. 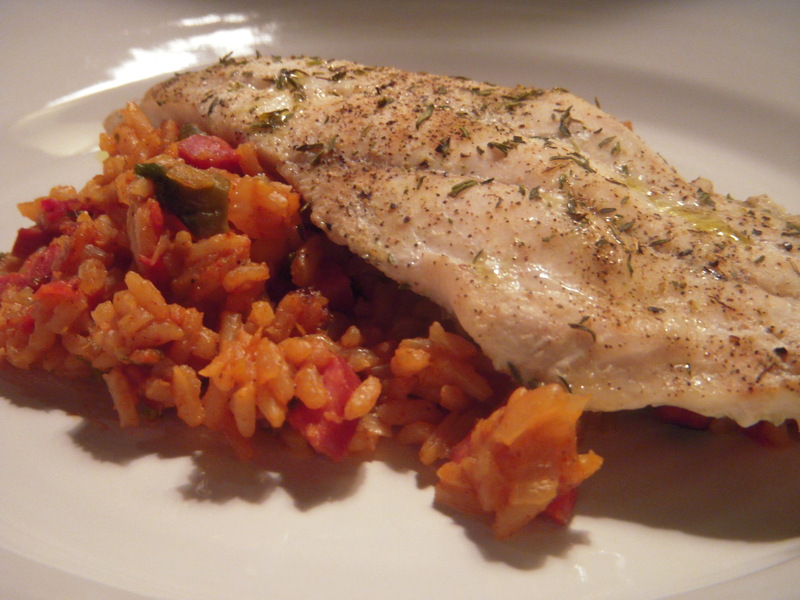 Serve the creole rice topped with the trout. It’s good!